This 27 1/2” X 32 1/2” original pastel painting of Sammy Sosa, “Up At Bat” is an Original Framed Pastel Painting I created from a game played at Pro Player Stadium now Sun Life Stadium in Miami Florida. I was at this game when he hit this his 49th home run of this season and the Cubs won the game 7-3. You can see the blurred images of the Florida Marlins players on the bench. 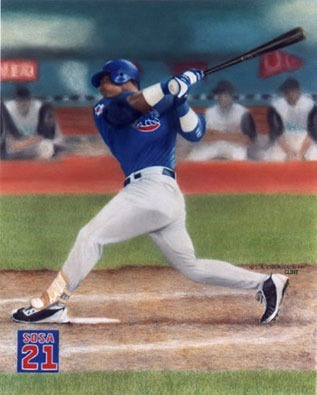 Sammy Sosa’s powerful stance and concentration is portrayed in this painting. If you are a Sammy Sosa fan this is a gorgeous collectible that is framed beautifully with UV Plexi-glass to protect the painting. There is a shipping charge for original sports paintings. 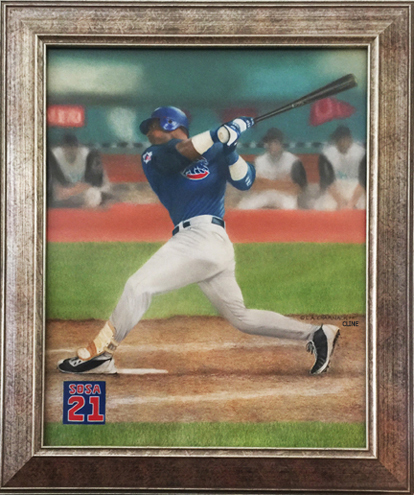 This original sports painting portrait of “Sammy Sosa” Up At Bat captures the power action of Sammy Sosa. You can see from his stance, his intense concentration and athleticism within the batter’s box. The sunlight bounces off his form and displays his celestial presence to onlookers within the stadium. Accurately capturing this light, was challenging in this portrait of Sammy Sosa. Being next to the dug out I could really see his features and in fact had a nice conversation with him. This game portrayed in the painting was played at Pro Player Stadium now Sun Life Stadium in Miami Florida. I was at this game when he hit this his 49th home run of this season and the Cubs won the game 7-3. Ypu can see the blurred images of the Florida Marlins players on the bench. It was important for me for you as the view to feel that Sosa is standing solid in the dirt. What I did was to use layers of pastel and sharpened the image of Sammy Sosa putting him in the foreground. You can almost feel his elbow piercing through the painting. On September 29, 2002 “Sammy Sosa” Up At Bat, belted a two run homer at Wrigley Field off of Pittsburgh Pirates pitcher Josh Fogg in the first inning to end his 2002 season with 499 career home runs. If you have any questions about this original Framed Pastel Art Painting measuring 27 1/2″ X 32 1/2″ contact me directly through the secure contact page or call.